I have vague memories of Yo-kai Watch from when it first came to the states. I never beat the first game and I ended up forgetting about it for a few years. However from what I remember, the show reflects the game and the world pretty well. The story follows a kid named Nate who finds Whisper, a Yo-kai, who gives him the Yo-kai Watch. This watch allows him to see Yo-kai, mischievous spirits that are invisible without the watch. The show mostly follows Nate’s adventures as he helps and befriends Yo-kai. This seems to be the main plot of the show. There doesn’t appear to be any overarching story or conflict. Remember, these are only a few episodes from the first season. So maybe there eventually is a set goal or conflict. However, there are a lot of positive lessons. So parents, this show is a good one to watch with your kids. Nate, the protagonist, doesn’t seem particularly invested in the world of Yo-kai. He’s essentially forced to solve everyone’s problems and he seems to reluctantly just accept it. For example, when he first meets Whisper, a literal ghost, he trie to walk away from the conversation three times and he barely seems to care that he is talking to a magical ghost that appears from a capsule machine. That isn’t exactly a good way to introduce your main character. Also, the structure of the show is rather confusing. At first I thought the show had the “two 11 minute stories merged into one 22 minute episode” type of structure that many cartoons have, but no. Sometimes it’s one really long story combined with a story that’s really short. Sometimes it’s THREE stories in one episode. It’s really inconsistent. The show also seems oddly inconsistent in its tone. The show is mostly comedic, however one story has no comedy and is entirely serious. It just feels really random, but maybe it ties in with Season 2. It is entertaining overall and a series I would have probably watched when I was younger. This is a very interesting and cool DVD to watch! It has all the qualities that make a good animated series – interesting plots, vivid and clear animation, a fun mix of humor and action all in one! I really like when the action in the story, because it makes me feel more excited and enthusiastic to watch what is going on in. 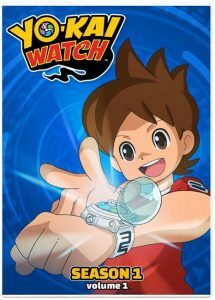 The story is about Nate, a normal boy, except he has a Yo-kai Watch which gives the person who has the watch the power to see Yo-kai. Yo-kai are things that cause your daily annoyances such as, when you have bad luck and fall or, you really have to go to the bathroom but there is a really long line, or you have a song stuck in your head that you hate or dislike. The Yo-kai are mischievous and you never know when they might show up or what they might do. Also, the Yo-kai are invisible, so you can’t see them unless you have the Yo-kai Watch. This DVD reminds me of Pokemon a bit so, if you like Pokemon I recommend this for you! I am pretty sure the creators of this film got inspired or got the idea from Pokemon. 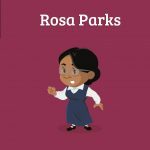 Books of the Week: Black History Month favorites for young children! This one is such an inspirational book! This is a lyrical picture book that is sure to inspire! 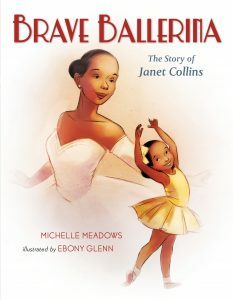 It is a tribute to Janet Collins, the first African American principal dancer at the Metropolitan Opera House. It is a beautifully told story of a gifted African-American pioneer in the arts. For fans of the award-winning picture books Firebird by Misty Copeland and Radiant Child by Jean-Michel Basquiat. With a spotlight on one of the most distinguished African-American dancers of the century, this is an important diverse offering from two African-American creators who are passionate about their subject. Lyrical rhyme fortified by strong back matter makes for a great read-aloud and classroom tool. WOKE BABY jokes about babies’ sometimes unpredictable sleeping patterns and finds parallels with how social activists don’t fall asleep when fighting for justice. For parents and gift givers who bought A IS FOR ACTIVISM and FEMINIST BABY. Theodore Taylor is an up-and-coming artist working in a new, rounder, more baby-friendly style. This book is both bright and fun, as well as adorable. 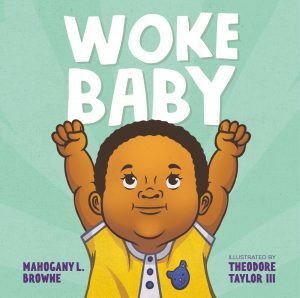 WOKE BABY is not only inspiring but also fun to read aloud. This one certainly made me chuckle! These are must-reads for young children! I love the cheerful illustrations and the kid-friendly infographics! 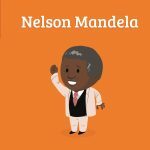 Biographies with personality! 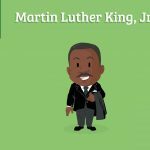 These colorful, commercial, bite-size biographies introduce readers to fascinating figures from U.S. and world history, and feature engaging storytelling, cheerful illustration, kid-friendly infographics, along with puzzles, quizzes and games. Pocket Bios titles include men and women from history, exploration, the sciences, the arts, the ancient world, and more. These are engaging stories, packed with cheerful illustration and kid-friendly infographics — plus puzzles, games, and mazes. Self Disclosure: I received free samples of the above books but only feature books that I highly recommend, Images were also provided. As Hiccup fulfills his dream of creating a peaceful dragon utopia, Toothless’ discovery of an untamed, elusive mate draws the Night Fury away. When danger mounts at home and Hiccup’s reign as village chief is tested, both dragon and rider must make impossible decisions to save their kind. KIDS FIRST! 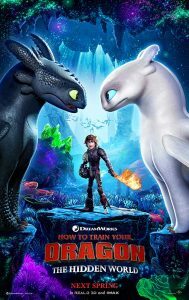 Film Critic Arjun N. comments, “How to Train Your Dragon: The Hidden World brings one of animation’s best trilogies to a beautifully done conclusion. Maturing voice talent and wild animation make for a mix of satisfying and bittersweet that just works.” Brandon James R. adds, “best movie of 2019, so far. This movie has something for all ages. It’s filled with lots of action, surprises and humor. This full length animation, co-written and directed by Dean DeBlois, is a definite must see!” See their full reviews below. How to Train Your Dragon: The Hidden World brings one of animation’s best trilogies to a beautifully done conclusion. Maturing voice talent and wild animation make for a mix of satisfying and bittersweet that just works. Any fans of this franchise in general must check this out. The movie follows Hiccup (Jay Baruchel), now chief of Berk, alongside lover Astrid (America Ferrera) seeking to create a dragon utopia. Plans take a shift when Toothless smittenly chases and falls in love with a female Night Fury, dubbed Light Fury, the last of its kind. However, when dragon hunter Grimmel (F. Murray Abraham) seeks to finish what’s he started and eliminate all the Night Furys, starting a cat and mouse game, all of Berk must leave the only home they have known and journey to a mystical hidden world and prepare counterattack. True destinies are revealed, dragon and rider will do whatever it takes to protect and find peace for all they treasure. Jay Baruchel leads this ensemble cast as my favorite character Hiccup and is impressive in showcasing the growth of the character. From the first movie, we follow him from teen to adult, and his struggles to lead or even marry Astrid remain the movie’s compelling center. His iconic bond with Toothless goes to further extents as he finds wrong in not providing his pal with the life he truly wants and a loving partner. Light Fury provides a great love interest for Toothless and some of the movie’s most impressive special effects, with their chase being one of the most visceral scenes put into any animated film. America Ferrera provides a smart adviser to Hiccup and also a best friend, with their decision to marry being one of the most beautiful and realistic aspects of this conclusion. This line-up of heroes wouldn’t be complete without a formidable villain and F. Murray Abraham’s Grimmel gives us one. Grimmel is truly charismatic and a force to be reckoned with. He steals every scene he’s in. Watching his cunning plans unfold is a true treat. Cate Blanchett returns as Valka, giving Hiccup more advice in his adulthood. However, Gerald Butler’s cameo appearances in flashbacks truly characterize Hiccup’s bond with his parents. Most of the other Vikings from past movies return, with Kristen Wig’s Ruffnut being a huge standout, and her improvisation is the funniest scene. Dean DeBlois spectacularly directs this film, with a mastery of some of the greatest animation of the decade. He continues the great work found within the past two entries and challenges himself with the Hidden World, which is the biggest visual feast of the film. My favorite scene is the entire epilogue which wraps up the movie and series perfectly. It remains one of the most emotionally effective conclusions in any movie, and no fates are left unanswered. My only problems with the film are with its initially slow pace, that don’t showcase the truly grand, epic ending at first. Still, the pace quickly picks up with its fair share of epic battles and, while it’s not always of that same epic scale, the characters bring out the heart of the film. DreamWorks’ How To Train Your Dragon: Hidden World is the best movie of 2019, so far. This movie has something for all ages. It’s filled with lots of action, surprises and humor. This full length animation, co-written and directed by Dean DeBlois, is a definite must see! Following the format of any great adventure, screenwriters DeBlois and Cressida Cowell, include everything needed to keep the continuity flowing from the first installment of How to Train Your Dragon to this one. In what is supposed to be the last movie of this trilogy, we see Hiccup, now as the spirited ruler of Berk, protector of the dragons and boyfriend of his longtime friend, Astrid. Hiccup discovers that Toothless, his best bud, is not the only Night Fury alive. He learns that danger is coming and that the only option of surviving is to seek out the Dragon Utopia that his late father once spoke of before a hired tyrant named Grimmel finds it first. There’s lots of fire, fighting, roaring, funny bits and mushy stuff too, but you have to watch it to find out who gets the best of who. Cinematographer, Gil Zimmerman, is terrific at laying out the scenes, which help the viewers understand the story. We get to see how the Vikings really feel about their dragons and what happens when Hiccup finally meets his match. Every moment feeds off the first and excitement is built off of reflections from the first two movies. The production designers and art directors help keep viewers connected to the characters by giving us realistic scenes and sets that capture you with bright lights and strong graphic details. When darkness comes, critical moments become more authentic. When there’s action, you can’t help but stay focused. Toothless’ upgrades and the new, much larger dragons are epic! Jay Baruchel is super cool as Hiccup, my favorite character. He’s grown, has the best dragon ever, is Chief of the Vikings and everyone loves him, except the Night Fury Slayer and those dragon captors. He has crazy friends like Tuffnut & Ruffnut, who keep you laughing throughout the movie. Hidden World is a screen adaptation of the book series by children’s author, Cressida Cowell. It sends you on a fun journey with some curious characters with strange outlooks on life. These anthropomorphic characters make you forget that you are actually watching an animation. Lessons to take with you after seeing this flick are to make good choices and to allow others to do the same thing, even it doesn’t benefit you. I give DreamWorks’ How to Train Your Dragon: Hidden World 5 out of 5 stars and recommend it for ages 3 to 18, as well as adults. It’s one film for everybody! Grab your friends and parents and get to your local theater for the premiere, February 22, 2019. Remember to like and subscribe to our channel. Until next time, I’m Brandon for KIDS FIRST! Film Critics. That’s a wrap. Peace out! The LEGO Movie 2 * Vibrant Voice Talent, Quippy Writing Make For A Cartoon Genre-Defying Blast! The citizens of Bricksburg face a dangerous new threat when LEGO DUPLO invaders from outer space start to wreck everything in their path. The battle to defeat the enemy and restore harmony to the LEGO universe takes Emmet, Lucy, Batman and the rest of their friends to faraway, unexplored worlds that test their courage and creativity. KIDS FIRST! Film Critic Arjun N. comments, “The LEGO Movie 2: The Second Part is a superb follow-up to the original film that lives up to the years’ worth of hype surrounding it. 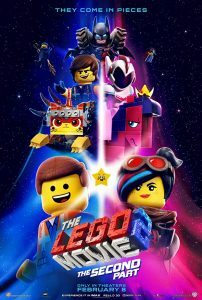 Vibrant voice talent, including new standouts, and quippy writing make for a cartoon genre-defying blast.” Sahiba K. adds, “With all its clichés, The LEGO Movie 2: The Second Part is as original as its predecessor! An intricately, well thought out plot steals the show along with jokes that hit my funny bone.” Zoe C. wraps it up with, “I loved that everything is still awesome! It’s dynamic, colorful and funny. While watching this film I saw how cool all the little LEGO figures look, because the animation is so well done that they look like they’re really moving and the amount of detail this film is incredible.” See their full reviews below. The LEGO Movie 2: The Second Part is a superb follow-up to the original film that lives up to the years’ worth of hype surrounding it. Vibrant voice talent, including new standouts, and quippy writing make for a cartoon genre-defying blast. Any fans of the LEGO franchise must check this out. The movie follows five years since “everything was awesome,” as the citizens of Bricksburg suffered irreparable damage from the forces of LEGO DUPLO invaders. Bricksburg descended into Apocolaypseburg, where the citizens brood. Luckily, Emmet (Chris Pratt) always retains hope, even when General Mayhem (Stephanie Beatriz) captures many of his friends. This takes Emmet on a journey across multiple unexplored worlds, including a central DUPLO musical land, as the fate of the LEGO galaxy relies upon him. The ensemble cast not only features one role from Chris Pratt as, of course Emmet, but also as Rex Dangervest. He continues to shine as Emmet, with the reluctant hero taken to deeper territories as his hope to regain his friends is tested. Rex Dangervest shines and is my favorite character, as he remains a charming presence and even mirrors many of Pratt’s roles in Hollywood. His relevance to the plot also provides for some mind-bending revelations. Elizabeth Banks, as Lucy/Wyldstyle, continues in her heartfelt buddy dynamic with Emmet, as she even wants him to do something more intimidating. This proves for an interesting drive in his quest to find Lucy. New additions from Stephanie Beatriz and Tiffany Haddish are welcome ones, with their unique DUPLO builds taking the spotlight. In particular, Tiffany Haddish as Queen Watevra Wa’Nabi, shines with her malicious intent and deceitful musical numbers. Will Arnett, Allison Brie and Charlie Day return from the previous movie and continue their signature work, with all even having a moment to shine amid this gigantic cast. Mike Mitchell spectacularly directs the movie with a great mastery of unconventional animation found within, that pans out beautifully. Also, Phil Lord and Christopher Miller return with a script that might even be funnier and more meta than the original. My favorite scene is the musical number between Batman and Queen Watevra Wa’Nabi that is just a true showcase of this series’ unique sense of meta-commentary and humor. My problems with the movie do stem from the real world scenes. Even though the dynamics between siblings Finn (Jadon Sand) and Bianca (Brooklynn Prince) is a very touching and even humorous one, it just doesn’t lead to much and feels tacked on, with the time gap seeming like something of an afterthought. With all its clichés, The LEGO Movie 2: The Second Part is as original as its predecessor, The LEGO Movie! An intricately, well thought out plot steals the show along with jokes that hit my funny bone. The two types of animation, stop motion and CGI, are used at appropriate times, connecting the LEGO world and our world to merge reality with imagination. Chris Pratt voices two characters, Emmet and Rex, who are disparate characters. Emmet is innocent and kind while Rex is more hardened and a typical action hero. It is evident that Chris Pratt voices Rex because of Chris Pratt’s experience in the role of the action hero, but the way that he is able to contrast that with the sweetness of Emmet is commendable. Tiffany Haddish has an abundance of personality in her voice that is necessary for her character, Queen Watevra Wa’nabi. The uniqueness of her voice is key in helping understand who she is. Her character has an ability to change shape, preventing us from viewing who she really is, so her voice tells us the most about her personality. The LEGO Movie 2: The Second Part is surprisingly a bit of a musical, with original songs. Ironically, my favorite song is actually in the end credits, although it is hard to pick a favorite. Each songs’ lyrics are comedic and manage to have very catchy beats. By the time I finished watching the film, “The Catchy Song” was stuck in my head all day, but I honestly did not mind. It might even be my favorite soundtrack from a movie. The LEGO Movie: The Second Part is fascinating and I loved that everything is still awesome! It’s dynamic, colorful and funny. While watching this film I saw how cool all the little LEGO figures look, because the animation is so well done that they look like they’re really moving and the amount of detail this film is incredible. This movie picks up where the first LEGO Movie ends and adds new exciting scenes. This film is about our hero Emmet (Chris Pratt) and his friend Lucy (Elizabeth Banks) battling in outer space. The Duplox LEGO blocks attack the regular LEGO world, specifically the citizens of Bricksburgh. Everyone tells Emmet he should grow up, because he thinks everything is always awesome and LEGOS are facing a terrible menace. We meet a new character named General Mayhem (Stephany Beatriz) whose identity is unknown and whose voice is very intriguing. She takes all of Emmet’s friends, including superhero Batman (Will Arnett) faraway for a strange ceremony. In this journey, they travel into galaxies and planets and they are part of several music episodes. While Emmet is sometimes insecure and Lucy is battle ready, they are forced into parallel adventures that lead them into a re-discovery of empathy and friendship. I love how the movie uses all kinds of LEGO brands – LEGO Friends, regular and Duplox. There are many twists which make the movie a lot more interesting. At one point, you think the movie is over, but it’s really not. There are lots of new, fun characters and the jokes appeal to both kids and grown-ups. I also love that you can never really guess what is going to happen next, because there is always a twist. All the characters have very distinctive personalities. The work of the voice actors is fantastic, as they are in the first one. And, there are a lot of references to classic films. In this film, human participation seems even bigger than in the first one. I like those scenes, because it makes it more evident that the story is told from the LEGO’s perspective. The rhythm is great and it is funny and touching at the same time. It’s awesome how the producers have created a world made of little, and not so little bricks, that is so engaging for all audiences. Another thing I love about this film is how they took songs from the original movie and made them completely different. And, you don’t need to see the first movie to understand this one. This film proves that sequels can be awesome! The message of this film is that we don’t always need to grow up. Being mature does not mean that we lose our kindness, sweetness or imagination. I give this film 5 of 5 stars and recommend it for ages 5 to 12 and adults as well. The Lego Movie: The Second Part opens February 8, 2019 and I totally recommend it! Be sure to watch our YouTube Channel for my videotaped review of this one. Alita is a creation from an age of despair. Found by the mysterious Dr. Ido while trolling for cyborg parts, Alita becomes a lethal, dangerous being. She cannot remember who she is, or where she came from. But to Dr. Ido, the truth is all too clear. She is the one being who can break the cycle of death and destruction left behind from Tiphares. But to accomplish her true purpose, she must fight and kill. And that is where Alita’s true significance comes to bear. She is an angel from heaven. She is an angel of death. KIDS FIRST! Film Critic Rohan F. comments, “Alita Battle Angel is an epic, action-packed film. It has incredible CGI and accomplishes lots of world-building. It is based on the Manga series Battle Angel Alita by Yukito Kishiro.” Ivey H. adds, “This story empowers us young ladies. She is brave, strong through rough times and proves people wrong. 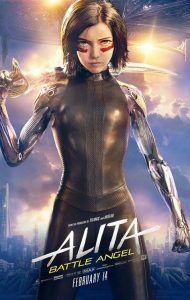 I really felt the emotions and turmoil of this coming of age tale of Alita.” Siaki S. sums it up with, “I really like this film because, even though Alita is a cyborg, that doesn’t stop from her from doing everything she can to make her discover who she actually is. Although she is a machine, she is still treated as if she is a human being.” See their full reviews below. Alita Battle Angel is an epic, action-packed film. It has incredible CGI and accomplishes lots of world-building. It is based on the Manga series Battle Angel Alita by Yukito Kishiro. When Doctor Ido finds a living machine in the scrap yard, he takes it back and calls it Alita. When she wakes up she realizes all her memories have been lost. She finds herself in a crazy world in Pig City, beneath the last floating city. She tries to restore her memory and makes some friends and even more enemies. While it’s an interesting story, I feel like it’s not the focus of the film. Instead, the focus appears to be the battle scenes, because there are lots of them. While being beautiful and entertaining, I feel many were unnecessary. I really liked the fight scenes. The unique fighting style used by Alita makes them interesting to watch. The CGI is incredible. I almost forgot Alita is a CGI character because of all the facial detail. The sport Motor Ball is unique and explained quite well. I found the ending left me wanting more. The character design in this film is wonderful. All the different androids are visually impressive. They are so unique. You can tell what they can do just by looking at them. The sets are also very well designed and stick to the theme. The floating city is very intriguing. I enjoyed how they explained little bits of it. However, this movie feels like a long setup for a sequel. The moral of this film is to not stand by while people are being hurt – to speak up in the face of injustice. Unfortunately, although this message is spoken a few times, it isn’t communicated very well throughout the plot of the movie and seems a bit like an afterthought. The music is great. I enjoyed it without being distracted by it. It varies in each scene but keeps to a coherent theme throughout the film. My favorite scene is when Alita goes into the hunter-warrior bar and tries to recruit people. This scene is very entertaining to watch and is choreographed brilliantly. It also introduces a bunch of interesting hunter-warriors. They all have entirely different fighting styles which makes this scene interesting to watch. I give this film 4.5 out of 5 stars and recommend it to ages 11 through 16. It opens February 8, 2019 so look for it. This is an extraordinary animation film by James Cameron about a young girl who has forgotten her past and is trying to find herself. This story empowers us young ladies. She is brave, strong through rough times and proves people wrong. I really felt the emotions and turmoil of this coming of age tale of Alita. This story is set in the future, after terrible devastating world event. It is about two worlds, one above and one below. It is action packed with villains and heroes. Alita is found by a cyborg Dr. Dyson Ido (Christoph Waltz) in a junkyard. He refurbishes her into a cyborg part-human and part-machine. The young Alita is trying to figure out her past. Meanwhile, she discovers her hidden abilities to transform into an elite fighter, athlete and warrior. She never looses heart, as she becomes a young woman and haves to deal with several conflicts. The film is directed by Robert Rodriguez and written by James Cameron, a creative genius who is known for many other films such as Titanic and Avatar. The lead character, Alita is played by Rosa Salazar. Rosa truly takes you through the emotions of her character. Alita’s human sidekick, Hugo, is played by Keean Johnson. He is her teenage first love. The villains are played by Mahershala Ali and Jennifer Connelley. Ed Norton makes a cameo appearance at the end which makes me believe there will be a part two and we will see more of him. The CGI and F/X in this film are so vivid and realistic. It is hard to tell animation from reality. The cyborgs’ transformer bodies are so creative and the costumes really bring light to the characters. The music, lighting and scenes are enhanced by the 3D movie theater experience. My favorite part is when Alita gets a new robotic body and is better than ever. It suits her. I also like when she decides to start a fighting league of her own. She signs up to be a bounty hunter, then tries to rally other bounty hunters. They do not take her seriously, but they will soon learn she is a force to be reckoned with. The bounty hunter Zapan (Ed Skrein) and the bounty hunter that loves dogs are pretty cool characters. The message in the film seems to never give up, even when the odds are against you. Never let anyone tell you who you are or who you should become. I really relate to the story line and it made me to want to be the best that I can. I give this film 5 out of 5 stars and recommend it for ages 13 to 18 due to adult language and violence content. Adults will also enjoy this film. This film opens in theaters February 14, 2019. Look for it. I really like this film because, even though Alita is a cyborg, that doesn’t stop from her from doing everything she can to make her discover who she actually is. Although she is a machine, she is still treated as if she is a human being. This amazing film is directed by Robert Rodriguez who also shoots, produces and scores many of his films in Mexico, as well as his home state, Texas. Rodriguez directed the 1992 action film El Mariachi, which was a huge commercial success. The story line here follows the one and only Alita, who is found in the scrap yard and taken to a nearby clinic by Dr. Ido who repairs all cyborg visitors. As Alita awakes, she has no memory of what happened, where she is or even who she truly is. As she explores the world little by little, she has minor memory recall about who she really is. The more Alita experiences her present life, she meets a lot of people who are just like her. Dr. Ido tries his best to keep her safe from any bad things coming into her life. The main characters in the film are played by a veritable who’s who of talent: Alita is played by Rosa Salazar (Parenthood, American Horror Story). In Rosa’s portrayal of Alita, we see that she is more than just a machine; she is also a warrior. Hugo is played by Keean Johnson (Heritage Falls), who really portrays Hugo as being a really cool and trustworthy guy. Dr. Dyson Ido is played by Christoph Waltz (Spectre). Waltz really surprised me in this role which suits him well. Plus, even though he is older, he still has great moves. Chiren is played by Jennifer Connelly (Only the Brave, Spider-Man: Homecoming, Winter’s Tale). Connelly shows us what an interesting character Chiren is and contributes to the idea of how she doesn’t look bad, but actually is. Mahershala Ali plays Vector. This character is quite different in how he communicates with the headmaster of Iron City, which is why people obey him. Ed Skrein plays Zapan as very intimidating, because of how he roams the streets as a big tough guy. You do not want to mess with him. The sets are pretty cool. I like the set at the local plaza where Alita first learns to play the game motor ball. I also really love the music in this film because, depending on the scene, the music changes within it and drives the story line alone. The costumes are quite amazing and different. They aren’t like the usual bad guy costumes. They are enhanced with CGI, which makes them quite tremendous. My favorite part of the film is when Dr. Ido comes to find Alita in a bar, where she is challenging hunter-warriors to fight with her if they lose. In between all of the chaos, Dr. Ido shouts “Stop it, Stop it right now!” Yet, no one listens to him until he says, “Or no one gets free repairs!” In less than a second, everyone releases each other from the chaos. I give this film 5 out of 5 stars and recommend it for ages 12 to 18, as well as adults. I think that everyone watching this will enjoy all the good reaction parts as well as jump scares. It opens in theaters February 14, 2019 so look for it. Available in Time for Mardi Gras 2019! 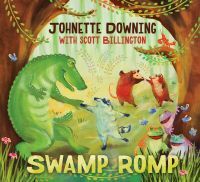 Inviting her many fans to “pass a good time” in the new year, Johnette Downing, a multi-award-winning and internationally touring musician, author, and former educator, will release SWAMP ROMP on February 15, 2019. This festive “Louisiana Dance Party” is Downing’s first project with partner Scott Billington, a three-time GRAMMY Award-winning record producer and musician. Featuring a stellar array of Louisiana musical talent, SWAMP ROMP arrives in plenty of time for Mardi Gras celebrations. The first single “How To Dress a Po’ Boy” (also the title of one of Downing’s many picture books) is available now from www.johnettedowning.com. Five years in the making, and debuted publicly at a recent GRAMMY Museum concert, this record is anhomage to the place, people, music, and culture that both Downing (a New Orleans native) and Billington hold dear. A tasty mélange of musical styles is reflected in these 15 original child-friendly songs (and one adapted traditional Cajun tune). The physical album includes 16 pages of lyrics and colorful liner notes, offering teachers and families a useful resource for learning about Louisiana’s rich heritage. The laissez les bon temps roulez spirit comes alive with the first title track, a jaunty harmonica-laced “swamp pop” party song. From there, Johnette and Scott take listeners for a ride through the landscape of Louisiana roots music, from New Orleans R&B to Cajun to traditional jazz. Supporting musicians include Irma Thomas, Roddie Romero, Joel Savoy, James Singleton, Doug Belote, Lee Allen Zeno, Matt Perrine, Wilson Savoy, Jake Eckert, C.R. Gruver, “Washboard Chaz” Leary, members of the Dirty Dozen Brass Band (Roger Lewis, Kevin Harris and Kirk Joseph), members of the Dukes of Dixieland (Kevin Clark, Craig Klein and Tim Laughlin), the McCrary Sisters and members of the ReBirth Brass Band (Keith Frazier and Derrick Tabb). Johnette and Scott will share the new songs at the New Orleans Jazz National Historical Park in January and February. Johnette also launched her new music video and book Who Got the Baby in the King Cake? The song for the book appears on SWAMP ROMP. More concerts and music videos are planned to celebrate the release of SWAMP ROMP during 2019. To extend the cultural learning, Downing is developing an activity guide for classrooms and playgroups. Visit www.johnettedowning.com and follow the group on Facebook for the latest news. I had the opportunity to listen to this CD and it’s a lot of fun! I highly recommend for young children! Self Disclosure: I received a free CD to facilitate this post. Images and information was also provided from Sugar Mountain PR. Looking for some great gift ideas for the kids? Especially the younger ones? Here are a few of my favorite choices! This is such an adorable board book for the younger kids! 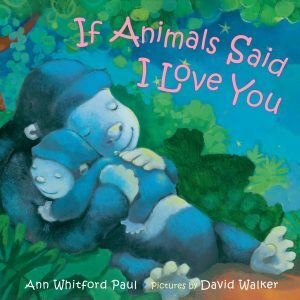 With signature gentle text and adorable illustrations, Ann Whitford Paul and David Walker’s books have broad appeal. As in the other If Animals… books, this title features gorillas, whales, hippos, and many other parent/child pairs celebrating the holidays. A great gift for the little loves in your life—on Valentine’s Day, or any time of year! 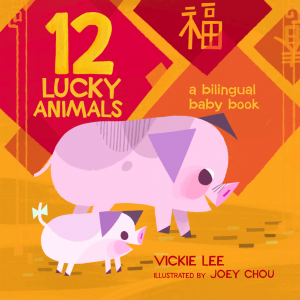 I love the beautiful illustrations in this one and it’s a really simple story for ages 2-5. This next one is another really adorable board book and I just love the main character in this one! This one is a must for toddlers! The main character is an adorable dog on his quest to find a birdie! It is fun and interactive with a lift the flap format and amazing illustrations! This one is by Clever Publishing and illustrated by a young artist named Elena Tsvetaeva. I highly recommend for ages 3-5. You can find on Amazon.com. This next one is not a book but young children will love to color these special Valentines by Clever Publishing! 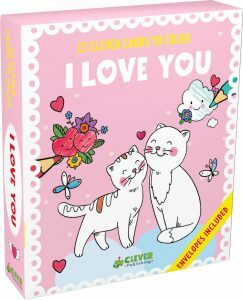 This set of 25 cards is so cute! I love the lovely pictures on the cards! My favorite is the two cats! I like the pretty colors of the cards and these are just perfect for ages 4+. Envelopes are also included. You can also find them on Amazon.com for under $10! This next one teaches that even if you are little you can make a big difference! 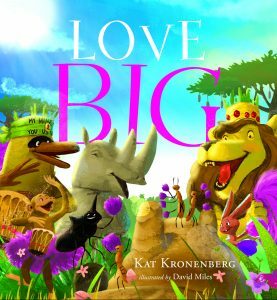 Love Big takes kids on an adventure through a once lush, thriving African savanna, which has turned dry and desolate. Hungry animals seek only their own interests, and Baboon watches as his friends begin to make poor choices instead of coming together to find a solution. But then Baboon witnesses something that fills him with hope! He watches as Rhinoceros gives Hare his snack and realizes that a transformative power exists between the animals once they realize that they are all on the same team. Using their newly discovered power, will these animals be able to band together to save the savanna? 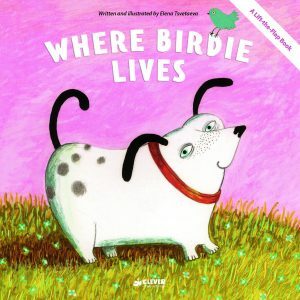 I love the brightly colored illustrations and the many lessons in this book for young children! Just perfect for ages 3+. Self Disclosure: I received free samples of the above books/cards to facilitate this special holiday post. 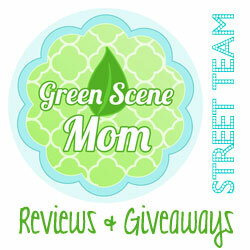 I only feature items under media reviews that I highly recommend! No other compensation was received. 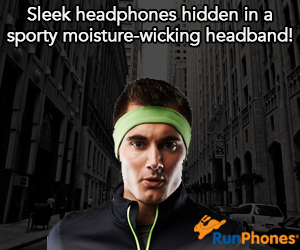 Images were also provided.